Would a Soccer Heading Ban End Traumatic Brain Injuries? A recent article in The New York Times asked whether a ban on heading in kids’ soccer games might prevent traumatic brain injuries (TBIs) altogether. While parents across the country would like to see changes to the sport that make it safer for children and teens, a heading ban might not be the answer to the problem. Although some advocates argue that “ridding youth soccer of heading . . . would virtually rid the sport of severe head injuries,” medical experts suggest this likely isn’t the case at all. In response to safety advocates’ arguments that youth soccer should ban heading, Dawn Comstock, an associate professor of public health at the University of Colorado, decided to undertake a study on the relationship between heading and head trauma. They ultimately published their findings in JAMA Pediatrics, but their research began with the National High School Sports-Related Injury Surveillance Study. This is an online database that Dr. Comstock administers, and it collects reports from across the country. The database primarily contains information supplied by athletic trainers, who “enter information about how and when an injury occurs, during a practice or a game, for instance; what symptoms the athlete experiences; and how long it takes him or her to return to place.” Injuries from nearly all varsity sports, both for boys and girls, are covered by the database. As such, soccer injuries make up a significant portion of the information. Comstock pulled data for soccer-related injuries that occurred between 2005 and 2014 for a total of about three million samples. Before the researchers could begin exploring the links between head injuries and the practice of heading the ball, another statistic jumped out: “concussions related to soccer are clearly on the rise.” Comstock and her colleagues determined that “the rate of head injuries among male and female high school players increased substantially throughout the years in question.” Yet heading was not the primary cause of those TBIs reported. Instead of learning that heading the ball caused serious concussions among soccer players, the researchers found instead that “the overwhelming majority of concussions resulted from player-to-player contact, especially among boys.” Indeed, about 70 percent of reported concussions in boys’ soccer resulted from player collisions. 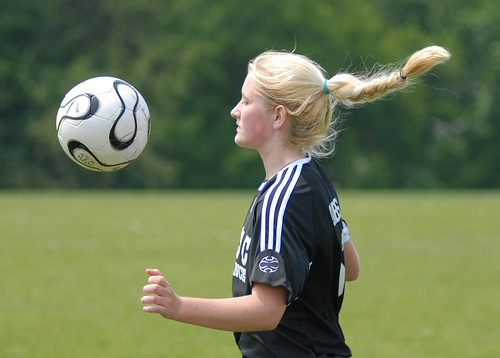 When it comes to girls’ soccer, 51 percent of head injuries occurred because players collided. It’s not that heading doesn’t play a role in soccer injuries. The data showed that heading was involved in a little more than 30 percent of boys’ soccer concussions and about 25 percent of girls’ soccer head traumas. But in general, heading wasn’t cited as the sole cause of the injury. Rather, those injuries in which heading was a factor also involved player collisions, “and it was the contact that typically caused the concussion . . . not the heading,” according to the researchers. If your child suffered a concussion or other head injury while playing soccer, you should discuss your case with an experienced San Diego brain injury attorney. An advocate at the Walton Law Firm can answer your questions today.